In the world we live in, with smart technology and resources, we can become overwhelmed with needing to do things quickly. We have grown to expect the instant response of our modern world where ordering food with a click of a button and having it delivered to your home is the norm. However, this mentality and this busy, fast-paced life can become overwhelming and stressful. It is essential to have a place that you can unwind and feel relaxed at the end of the day. Finding comfort in a relaxing space and creating a cozy home is vital. There are a few things you can do that will help transform your home into a stress-free sanctuary. One thing we have found beneficial in any space is adding natural elements, like plants and greenery. Plants are a great way to liven up your space. 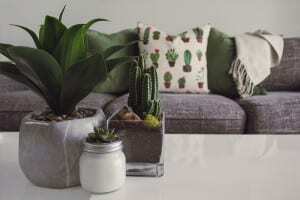 Whether you choose a low-maintenance succulent or something needing a little more TLC, what we like to call plant-divas, introducing these natural elements will enrich your cozy home and ultimately help reduce stress. If you’re intimidated by becoming a plant parent there are many nurseries in Victoria that can help guide you with your search for the right addition to your home. One of our personal favourites is Browns Florist, with locations in Downtown Victoria, Sidney, and Westshore. They have an abundance of species to choose from and their convenient storefront and knowledgeable staff make the visit well worth it. And if you’d like help sourcing your plants, and would like a little more guidance through the design of your greenery, we recently worked with Mod Pots to add some life to our office! As many of you are condo owners or seekers, we recognize that living in a condo may mean you are limited and may not have the luxury of a spacious interior. However, don’t be discouraged we have solutions. Creating a relaxing and comfortable nook is just as effective for your cozy home. It’s as simple as a reading corner with a cozy chair, warm throw, and the right lamp. Grab a cup of tea and a good book, turn your phone on silent and enjoy some valuable down time. Speaking of phones, technology can be a major contributor to our daily stress. We love our phones and computers when they work correctly, but as soon as we lose a couple bars of service or are prompted for an update, our immediate response involves stress. Much of modern technology is online based, meaning we spend a significant amount of time online or on social media. While social media can be a valuable tool for many personal and business reasons, it has been proven that taking a break from being online can help improve your mental capacity and give your brain a chance to catch up. Some of our social media tools, like Instagram and Facebook, are used daily with the hopes of connecting with people. While appreciating the value of online platforms for our personal lives & connections, we work to remind each other that time away from a screen can be just as valuable for productivity. Small adjustments made to your home, such as opening blinds to let in natural light during the day or keeping a soft blanket on your sofa, are simple & can be done instantly, yet can make a huge difference. Other changes like choosing soft paint colours or decorating your home with cozy rugs may need more time but are worth it for making your cozy home feel complete. If you’re in need of some extra inspiration, Pinterest is a great place to start! If you are looking for a new home to relax in now, or in the future, get in touch with The Condo Group Real Estate for more information at 250-382-6636.